Oh, how I love a noodle bowl. One of my favorite restaurants here on James Island, which sadly closed recently had the best noodle bowl. We used to love to go there on Wednesday nights just for their Noodle Bowl special. If you want a serious noodle bowl you really need to make your own stock. That restaurant told me that they make their own broth and cook it for 24 hours which I did not do. I just spiced up the Ramen water and added store bought veggie broth. You know what it was good and easy for a week night meal. 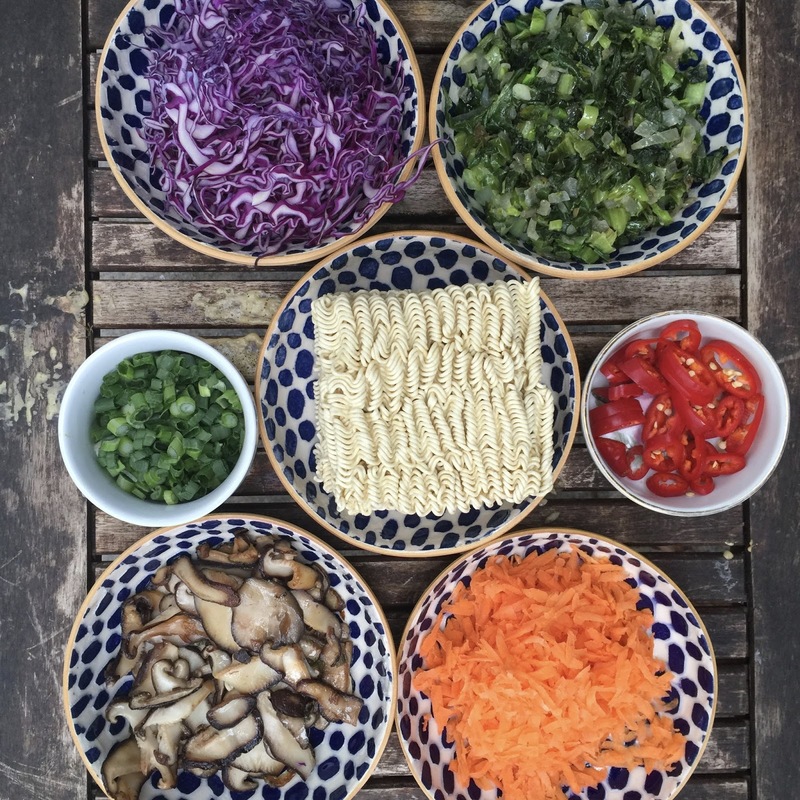 There are so many different ways you could make a noodle bowl so experiment and go crazy. You don't even have to use ramen you could use another type of noodles. I however like the texture and size of ramen noodles. Any veggies would work too- I think this would also be great with sautéed broccoli and or asparagus. I want to to mention 2 kitchen tools I use all the time: My grater and mandolin. I use my grater for so many things other than cheese. A mandolin makes finely shredded things so easy, just watch your fingers:) I love this Mandolin and it is on sale currently for only $14 I swear it works just as great as the expensive version I had before it. I like this handheld grater for when I need things grated finer like Parmesan cheese, lemon zest, and ginger. Then I use this big box grater for cheese. All are essential tools in my kitchen. In a skillet heat 2 tablespoons oil (olive oil, canola, peanut oil any of them work) and add chopped shallot, garlic, and ginger and cook 2-3 minutes. Add in Bok Choy and half of the diced green onions. Continue to cook until bok choy is wilted. Remove skillet and set bok chop mixture aside in a bowl. In that same skillet add a little more oil and the shiitake mushrooms. Sprinkle with salt and cook about 5 minutes. Then drizzle with soy sauce and remove from heat. Cook Ramen noodles according to the package. After mine cooked I added in 1 tablespoon soy sauce and several drizzles of hot sauce. I wanted ours to have more liquid because much of it cooked off so I added about 1 cup of vegetable stock and let it simmer. That is optional you don't have to add veggie stock. Add in a few slices of the chopped chili peppers or jalepenos to flavor broth at this point. Let it simmer about 15-20 mins on low just for the flavors to blend. Assemble bowls. I like to place the noodles on the bottom and then arrange the veggies (carrots, cabbage, sliced boiled egg, shiitake mushrooms, cooked bok choy, green onions, and a few sliced peppers for extra heat ) on top because it looks pretty. This way everyone can serve their bowls to their liking. Sterling won't eat ,any of the veggies so this way I could make his bowl plain with just noodles and load ours up. I love a good noodle bowl and I have never tried to make my own, this recipe sounds easy enough to tackle. Can't wait to try this out next week. I need to do this! My kids love noodle bowls and I have only made it once (the blue apron one). You have totally inspired me. Thanks, girlie. What a great idea!!! Thank you so much for sharing. Your recipes always look so wonderful! Yum, this looks so good! Thanks for sharing! So just want to make sure I understand- did you use the oriental flavoring packet that comes with the noodles? Ramen has kinda become a thing at nice restaurants around Richmond and Bryce loves it! I will definitely have to try this recipe! My husband is huge Ramen fan and I'm confident he could get behind experimenting with a noodle bowl. Looking forward to trying this soon! Thanks for sharing.